John Power founded the Powers distillery at John's Lane in Dublin in 1791. For a long time, Powers was the best selling Irish whiskey in Ireland. In 1966, the two remaining Dublin distilleries - John Jameson & Sons and John Power & Son, amalgamated with the Cork Distilleries Company of Old Midleton to form Irish Distillers. By 1974 the Dublin distilleries had closed their doors and all whiskey production moved to New Midleton in Cork. 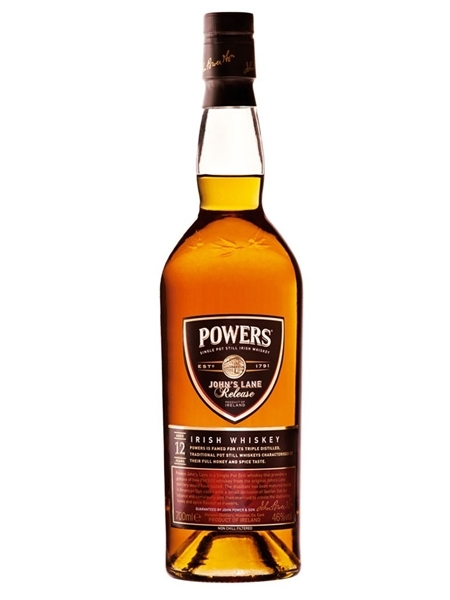 Powers John's Lane is an award winning and widely respected Irish Single Pot Still whiskey. It has been aged for a minimum of 12 years in ex-bourbon (mainly) and sherry casks. First released in 2011, it was named after the street where Powers whiskey originated. It is triple distilled and bottled at 46% ABV.